Global conservation efforts are celebrated for saving Guatemala’s Maya Forest. 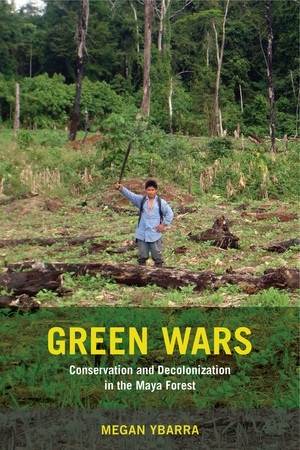 This book reveals that the process of protecting lands has been one of racialized dispossession for the Indigenous peoples who live there. Through careful ethnography and archival research, Megan Ybarra shows how conservation efforts have turned Q’eqchi’ Mayas into immigrants on their own land, and how this is part of a larger national effort to make Indigenous peoples into neoliberal citizens. Even as Q’eqchi’s participate in conservation, Green Wars amplifies their call for material decolonization by recognizing the relationship between Indigenous peoples and the land itself. Megan Ybarra is Assistant Professor of Geography at the University of Washington.